A little more than two months ago, the most anticipated game of the NBA regular season was played at the Staples Center in Los Angeles on Christmas Day. 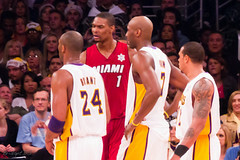 All anyone could talk about at the beginning of the NBA regular season was the matchup between the two-time defending NBA champion Los Angeles Lakers and the revamped Miami Heat. us was that this game would be a battle from start to finish, but that didn’t turn out to be the case as the Heat just dominated Kobe Bryant and company with a 99-80 victory. Coming into the rematch between these two NBA heavyweights, the Los Angeles Lakers are arguably the hottest team in the league with eight straight wins and a blowout win over the San Antonio Spurs last Sunday. The Miami Heat on the other hand are in a funk as they have lost their last five games and had a lot of questions surrounding the coaching staff and the fact that neither LeBron James, Dwyane Wade or Chris Bosh can hit the big shot when needed. On Thursday night, these two teams will battle it out once again, but this team the show will be in South Beach on the Heat’s home floor. Along with their ninth consecutive win being on the line for the Lakers, the defending champs will also make a big statement by proving that the Christmas Day massacre was nothing more than a fluke. As for the Heat, another loss to a championship caliber team may be the last straw as head coach Erik Spoelstra might get the boot and justifiably so. Can the Oklahoma City Thunder go deep in the playoffs?